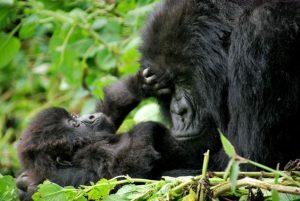 The 5 Days Uganda Gorilla Safari Wildlife Tour Uganda Queen Elizabeth Lake Mburo National Park is that packed safari package that offers visitors on Uganda safaris to have enchanting adventure experience of trekking the world gigantic ape species- the mountain gorillas protected in one of the ancient Impenetrable forests in Bwindi. 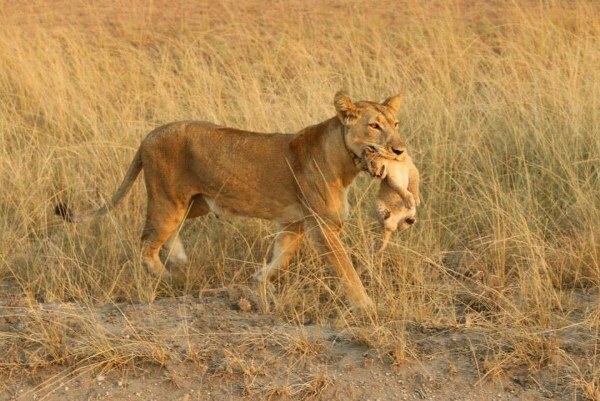 The safari starts from Kampala and it takes visitors to the rolling savannah combretum of Queen Elizabeth National Park where they may have an account of unique wild life including the tree climbing lions of Ishasha, the elephants, leopard, buffaloes and lions. From there, the safari connects visitors to Bwindi Impenetrable where they will have the best experience on earth to interact with the delightful apes in their natural Impenetrable forest habitat. Visitors will also have the opportunity to enjoy the sights and views of exclusive birds protected in Bwindi, explore the local Batwa community trails among others. 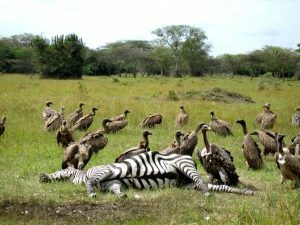 Visitors on Uganda Safari will also have that golden chance to visit the Lake Mburo national park which is unique savannah national park of its own in Uganda. The park houses the rare Impala (from which Kampala City derived its name), unique elands Zebras, Burch ell’s Zebras, Topi, bush backs. Lake Mburo located in the Centre of the park offers opportunities for you to experience boat cruise which is highly rewarding with the views and sights of crocodiles, hippos, as well as stunning water birds. Day 3 of the 5 Days Uganda Gorilla Safari Wildlife Tour Uganda Queen Elizabeth Lake Mburo National Park: Do an Early Morning Mountain Gorilla Tracking & afternoon Cultural walk to the Local Batwa community. After taking an early morning breakfast, visitors will be picked up by their experienced driver guide and embark on distance drive of 417kms about 6-7 hours’ drive from Kampala to Queen Elizabeth National Park-Uganda’s finest wildlife safari destination. The drive will take them through the charming scenic landscape of western Uganda. Arrive in Fort Portal town –the only scenic town dubbed the tourism town in Uganda for lunch stopover. Afterwards, they will advance with the drive distance of 144kms to Queen Elizabeth National Park arriving late in the evening like at 6-7pm and then they drive to their pre-booked lodge for Diner and overnight stay. After taking an early morning cup of tea, visitors will start their precious day with fascinating early morning wild game drive in the rolling savannah plains of Queen Elizabeth National Park. The drive will take them through Kasenyi which is a dwelling point for a broad number of wildlife including the elephants, buffaloes, lions, water bucks. The sights and views of an elusive leopard, defassa waterbuck, Uganda kob, Side stripped Jackal; Oribis among others might not be missed. 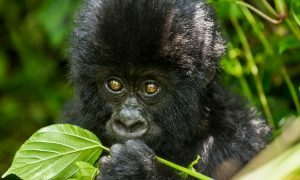 Retreat from the 3 – 4 hour game drive activity to transfer to Bwindi Impenetrable National Park. The drive will take them through the most popular Ishasha sector where visitors will have possibilities of meeting the tree climbing lions that tend to lie on the branches of fig trees and also have stopover for Lunch. Afterwards, continue with the drive to Bwindi Impenetrable National Park arriving in the evening for relaxation, dinner and overnight. On this special day, visitors will wake up very early in the morning; take an exuberant breakfast to give them the energy needed to hike the hills in the slippery trails of Bwindi forest when searching for the rare mountain gorillas. After breakfast, they will continue with their packed lunch to the park’s headquarters for early morning registration& briefing about the codes of conduct when trekking the Mountain gorillas. In this session, visitors will meet other trekkers and be divided in group of eight trekkers who are allowed to visit one habituated gorilla group. Afterwards, they will be led by UWA ranger guide to trek the gorillas in the thick creepers and undergrowth of afro monotone vegetation of Bwindi and this will take them between 2-8 hours depending on the movement of the mountain gorillas. Once up close to the group, a memorable, magical one hour is given to visitors to be with these gentle giants. They can decide to sit in the forest among the Gorillas, listen to them grumble to each other and marvel at the sheer size of the dominant male-the Silverback. It is an extraordinary feeling being with these beautiful yet endangered Creatures. When the one hour is done, they will retreat back to the trail head and proceed to the lodge for refreshment and late lunch. After lunch and relaxation, their driver guide will drive them to the nearby Batwa community for refreshing cultural walk. Here visitors will be guided by a local guide who will take them to the different communities to see how people have managed to survive through farming. They will see and study how local brew processed from fresh Bananas and forest remedies to get beer and Waragi. After that interesting cultural encounter, they will drive back to their respective lodge for dinner and overnight. Transfer from Bwindi Impenetrable national park to Lake Mburo national after their early morning breakfast. The drive journey of about 6-7 hours without enroute stopovers will take visitors through engrossing sceneries dotted with tea, coffee plantations and beautiful local people. On arrival to the park, they will enjoy their lunch at the park while marveling at the wildlife roaming at the park land. After lunch, they will embark on an afternoon boat cruise which sets of at 2:30pm on the majestic waters of Lake Mburo .The boat cruise takes them across 2-3 hours of maximum adventure. Not only does the boat trip offer them with the opportunities of encountering the game drinking on the lake side, but it also draws them closer to counts of Hippos, Nile Crocodiles and a range of water birds such as the colorful Kingfishers, magnificent Fish Eagles, Hammerkops and their enormous nests and even the prehistoric-looking Shoebill. Retreat back from the activity to their lodge for dinner and overnight. 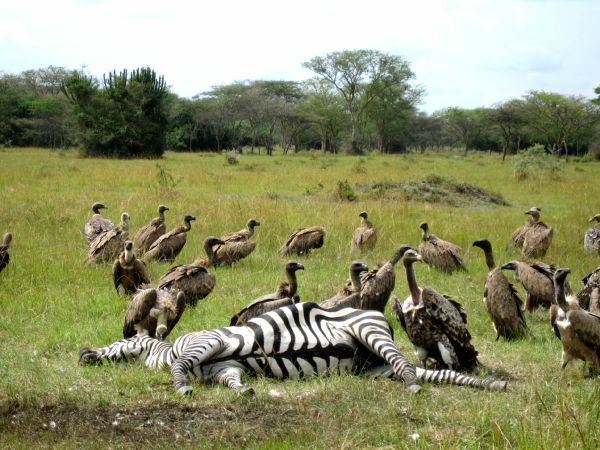 Day 5 of the 5 Days Uganda Gorilla Safari Wildlife Tour Uganda Queen Elizabeth Lake Mburo National Park: Do early morning Game drive & Transfer back to Kampala with en-route stopover at the Uganda Equator, Mpambire drum makers & Departure. Following an early morning breakfast, embark on the interesting game drive through the park in search of wild game. The connection of game tracks found in the eastern part of the park passes through a variety of beautiful landscape such as acacia woodland, wetlands vegetation, savannah grassland which supports the survival of different wildlife grazers including gigantic eland antelope, zebras, waterbucks, Klipspringer and the rare Topi, impala, warthog, oribi, buffalo, Defassa reedbuck. After the early morning game drive which takes 2-3hours, depart Lake Mburo driving back to Kampala. The journey to Kampala will take visitors through farmed hill sides and pristine range lands of the land of milk (Ankole region) to the Uganda Equator crossing Kayabwe, where they will also have stopover for fascinating water experiments and amazing photo shots and Mpambire Drum shop where they will have view of local drums. Thereafter, they will continue with the drive to Kampala capital city. On arrival, the driver giude will drive visitors back to their Kampala lodge or Entebbe international airport for their scheduled flight back home.